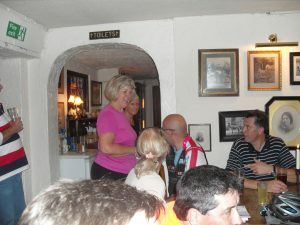 The White Bear pub at Fickleshole is clean, tidy, and popular – a real countryside gem. This pub is tucked away at the southern edge of the New Addington Housing Estate; an inner city residential scheme which seems to have escaped to rural Surrey. 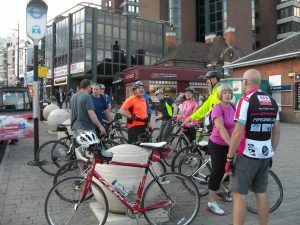 We met up at Bromley South; there were twenty or so of us and plenty of girls too. We held on to await the arrival of a couple of latecomers so we were just a little delayed getting away. It was nice to see Lynne again after a break and it was likewise nice to have a couple of new faces with us; one, on a borrowed bike, did particularly well because at least half of his gears didn’t work. I shall not mention his name to spare his blushes, or perhaps I never knew it in the first place. Anyway respect to you sir. You never gave up, particularly on the long slog up Featherbed Lane, and were rewarded with the satisfaction of knowing that you were not defeated and fully deserved the refreshments on offer at the’ top of the hill’. I sometimes wonder how the ride leaders ever discover some of these tiny little alleyways and muddy tracks they take us along. There were a couple of short cuts on this ride which defy belief – absolutely amazing. Anyway we were led along and through some of the most secret of secret paths, lanes and tracks. We also stopped for a moment to admire the tree people in a garden in Langley Park. As we arrived at the pub the rain started. There was a consensus that this was not in the forecast. Anyway it wasn’t going to worry us for a while as we all dived into the warmth of the bar where we met Tessa and her friend who had made their own way to join us, and Steve Watkins. We were so many that we got separated in the pub – a tribute to the continuing popularity of these evening jaunts! 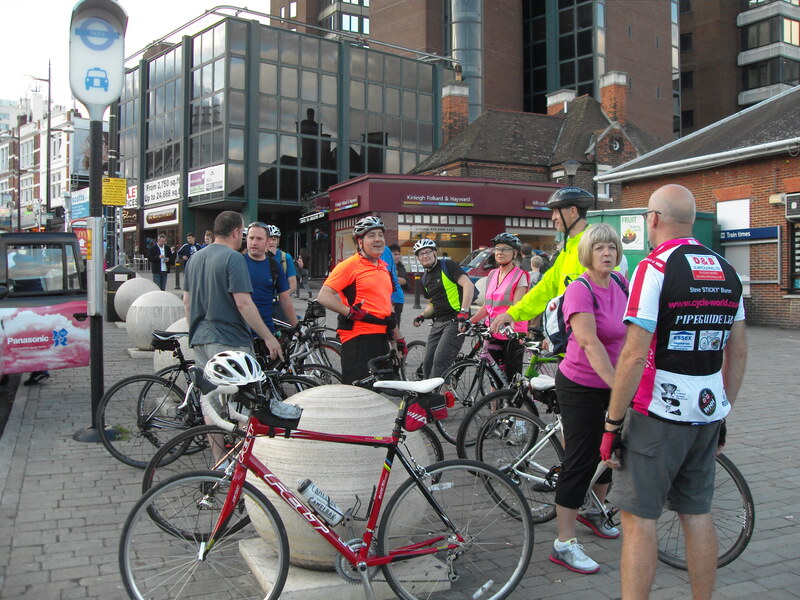 Some of us lightweights bailed out of the pub early, leaving the hard-core diehards. It was tsill raining. The return ride, mostly downhill, was damp with splodges of rain splattering down on us. Not enough to make us really wet but just miserable. After the murky darkness of Layhams Road I think most of us were glad to reach street lit roads of West Wickham. I got indoors and watched the rerun of the Bradley Wiggins Olympic time trial triumph – kinda puts my cycling efforts into perspective! Thanks to Spencer for being the ride leader this evening. By my computer it was an 18 mile round trip. More pics on the yahoo group page – link on the right. If you haven’t signed up please do so.